Novice Jon King finished 14th in his first ever race with co-pilot Jay Shepherd. Jon only took his ARDS test a month ago with Bookatrack Donington ARDS School and a few weeks later was sitting in his FunCup car ready to start his first ever race!! ‘it felt very surreal’ said Jon. 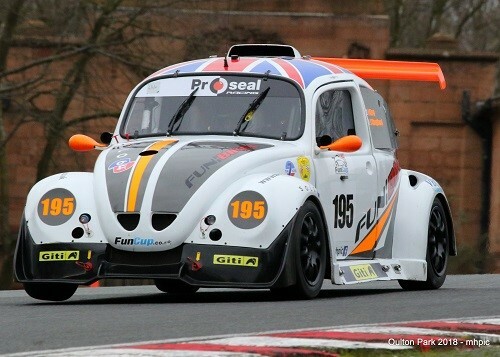 The season opener was a 4 Hour Endurance at Oulton Park. There was a 29 strong grid, and Fun:Bikes1 car 195 was pulled to start the race 4th on the grid. ‘Jon did amazingly well for his first race of the season, he kept the car on the black stuff and grew in confidence throughout the race’ says team director Jay Shepherd. Jon is really looking forward to the double header at Anglesey on 28th April.